October is the best month, shall we agree? The air turns cold, it’s finally breezy enough to open your windows at night; it’s the best time of year to snuggle up under a blanket and a bunch of cats to read and sip bourbon-y cocktails. Even better if your book is just a little bit creepy. This October, I’m all about the ghost stories. Here’s 3 I’ve read and recommend to you, and 3 new-to-me titles I’m going to read this month (with said blanket, cats, and bourbon-y cocktail). We Have Always Lived in the Castle, Shirley Jackson: If you have not read this book yet, stop whatever you’re reading right now and read this instead. I finished this book in a weekend and had a hard time wanting to read anything else—it was so good it took up every available space in my brain and stayed there. Constance and Merricat live with their Uncle Julian in a large house on the outskirts of town. They are ostracized, believing that one of the sisters murdered the rest of the family. Their quiet lives are disturbed when a distant cousin comes to stay with them, believing they have money hidden in the house. The ghosts of the sisters’ past are brought out in haunting ways, unfolding into a darkly beautiful story of family, community, the natural world, and history. Merricat is a witchy character, and the novel unfolds in a mystery-meets-magic style. We Have Always Lived in the Castle is beautiful and compelling, dark and creepy. Anya’s Ghost, Vera Brosgol: I came to this book through Vera Brosgol’s illustrations (one of her prints hangs in my foyer, and she one time posted a sketch on her blog that looks exactly like skinny versions of my husband and I). She writes graphic novels, paints, and has worked on the films Coraline and ParaNorman. Anya’s Ghost is about a normal teenage girl, Anya, self-conscious about her body, her Russian mother, and pretty much everything else in her life. She falls into a deep pit one day and discovers the ghost of a young woman who died nearly 100 years ago. 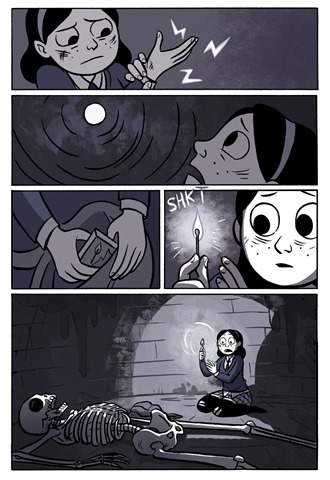 At first it’s all, “Cool, ghost friend!” but of course, Anya’s ghost becomes more and more manipulative and dangerous. The plot sounds a bit cheesy, but the pacing keeps this story fresh and the art is delicious. The Graveyard Book, Neil Gaiman: Pretty sure you’ve heard of this one. Another YA title but written in that distinctly-Gaiman voice that is captivating and a little disconcerting. Bod, whose family is dead, is being raised in a graveyard by an assortment of ghosts. Bod grows up learning ghostly skills (how to haunt, be invisible, and enter others’ dreams), and learns that the man who murdered his parents is still out for him. The novel twists and turns a bit before ending in this showdown, but every moment along the way is Gaiman-y fun. If you’re not into YA, try The Ocean at the End of the Lane, one of Gaiman’s most recent novellas, about a man who revisits his childhood home and rediscovers its magical, ghostly past. I love every Neil Gaiman book I’ve ever read, but this one is a particular favorite. “The Legend of Sleepy Hollow” and “Rip vanWinkle,” Washington Irving: America’s first and most well-known short stories. I have read these both before, but hello, when you see a copy at a used bookstore for $2 you pretty much have to reread them. I will be pairing this 80 page read with Tim Burton’s version of Sleepy Hollow. The Halloween Tree, Ray Bradbury: As much as I love Ray Bradbury, I am seriously under-read in his titles. The Halloween Tree has just been re-released with a fresh batch of illustrations by Gris Grimly, and if you order directly from the author he will personalize your copy with a clever little pumpkin on the title page. (Hat tip to JW Ocker from Odd Things I’ve Seen for an excellently-curated Halloween blog and this edition of the book). I actually don’t have much of a clue as to what this book is about, but I’m excited to read it with that lack of knowledge. 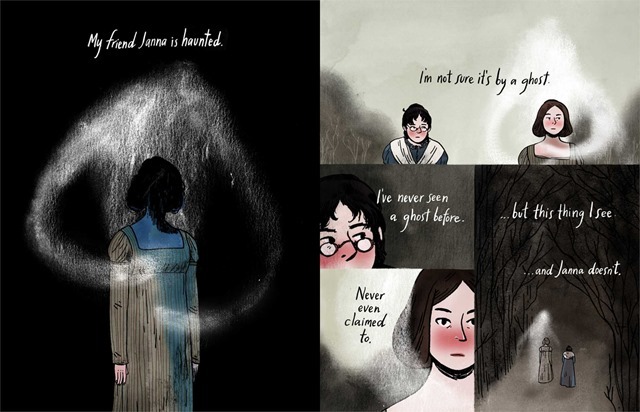 Through the Woods, Emily Carroll: Another graphic novel, but this one is a collection of graphic short stories (is that a thing? It is now.) All the stories are eerie and otherworldly, and I want to paste her illustrations to the inside of my eyelids, they are gorgeous and rich and creepy as hell. I thought long and hard about putting some Steven King on this list because, confession time, I have never read one of his scary stories. And I’ve heard they’re doozies. 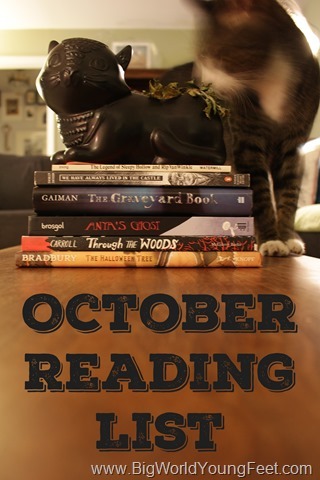 What are you reading this October? What spooky stories would you recommend?